Chinese smartphone manufacturer Huawei on March 26 announced the P30-series smartphones in a global unveiling event from Paris. 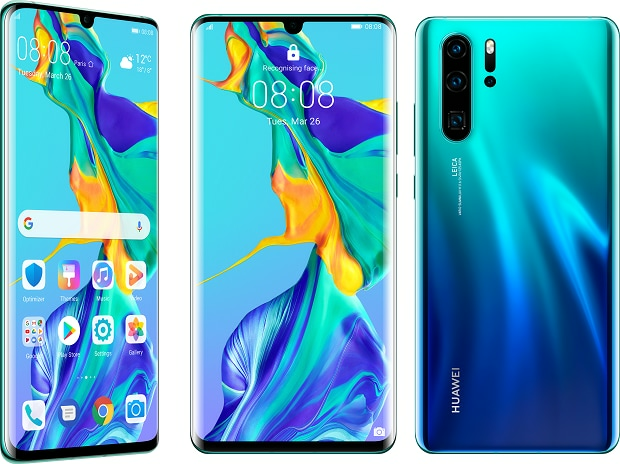 The series includes two devices – the Huawei P30 Pro and the Huawei P30 – both boasting OLED screen, triple camera module on the back (excluding time-of-flight 3D sensor in the P30 Pro), and in-display fingerprint sensor. Taking forward the imaging capabilities that the P-series stands for, the premium P30 Pro has been rated the best camera smartphone with an overall score of 112 by camera benchmark company DxOMark. The P30 Pro is Huawei’s first to boast a periscope telephoto lens capable of 5x optical zoom, 10x hybrid zoom and up to 50x digital zoom. The phone boasts a 40-megapixel primary sensor of f/1.6 aperture on the back, mated with a 20MP ultra-wide angle lens, 8MP telephoto lens, and a ToF sensor for 3D mapping. The phone’s primary sensor and the telephoto lens are backed by optical image stabilisation and the rear camera module supports artificial intelligence-based stabilisation for shake- free photography and videography. On the front, the phone has a 32MP selfie camera of f/2.0 aperture. Called the Huawei SuperSpectrum sensor, the primary 40MP sensor on the P30 Pro has a new RYYB (red-yellow-yellow-blue) pixel matrix, instead of the traditional RGGB (red-green-green-blue) bayer filter. This allows the sensor to capture more light and achieve higher ISO speed of up to 4,09,600, resulting in better hand-held low-light imaging. Interestingly, the Huawei P30 Pro is capable of using all camera lenses while recording a video. Besides using the primary 40MP lens for improved low-light video recording, the phone also uses its 8MP periscope telephoto lens for quick close-up zoom. The phone also supports dual-view video mode, in which the phone uses both the SupreSpectrum sensor and the SuperZoom lens simultaneously to record dual perspectives. The Huawei P30 rear camera, on the other hand, has a 40MP primary sensor of f/1.8 aperture, 8MP telephoto lens capable of 3x optical zoom, and a 16MP ultra-wide lens of f/2.2 aperture. It also has a 32MP selfie camera of f/2.0 aperture on the front.